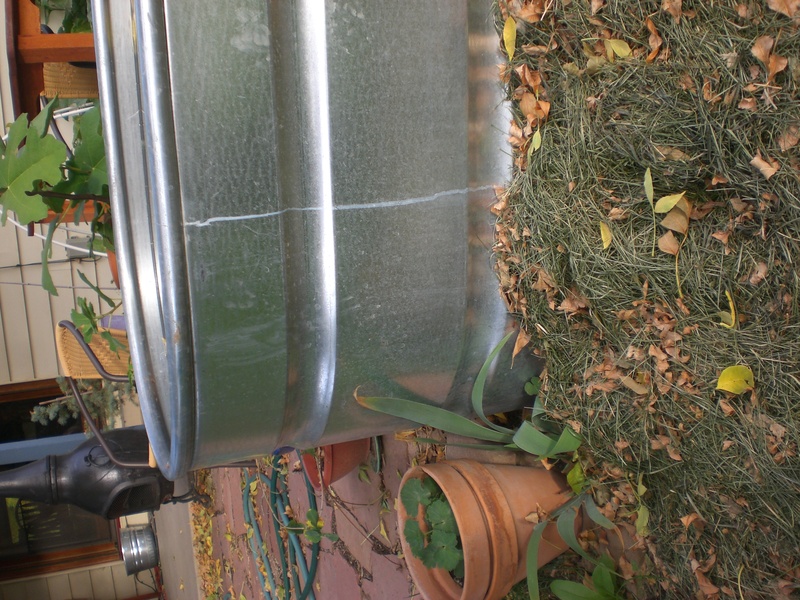 I keep upgrading my water gardens- I started with a galvanized washtub, which held pretty much 1 fish and some floating plants, then I got a plastic liner for a whiskey barrel, which had space for 2 fish and some floating plants. This year, I invested my fortune in a horse trough, which holds about 130 gallons of water, lots of plants and 10 goldfish. At least at the beginning of the year it had 10 goldfish. There’s been some attrition. Birds love any water feature, no matter what size, and in the years since I have been putting in container ponds, more and more birds have come to the yard. I have made a concious decision not to have a pond in the ground- for one thing, I think it shrinks the pond. My tank takes up a good amount of space in the landscape- it provides a structure, a shiny backdrop, a formal oval of water reflecting the sky. Most naturalistic ponds don’tlook very natural to me, unless they are a lot huger than I have space for. I think A 130 gallon in-ground pond would look puny and insecure in my garden. 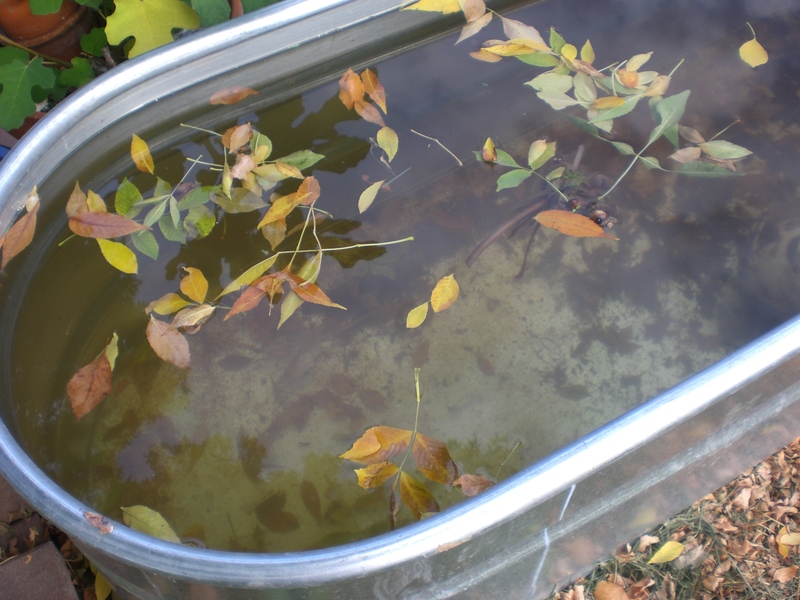 When I chose the galvanized metal tank, I decided that I wanted it to not look naturalistic- I wanted the informal formality of an above ground pond. When we had a party this summer, we put in floating candles. It looked magical. Intalling was easy- I leveled out the place I wanted it to go, digging out the weedy grass next to the patio, and stretching space out- there is a foot wide tulip bed to the west of it, where tulips and irises will help conceal the metal. Maintainance is easy, too, maybe too easy, considering how many fish have died this summer. I dip my watering can in every few days to water tomatoes and potted plants, then top the tank up with a hose. Water hyacinth and a papyrus provide filtration and ogygenation for the fish, and mosquito larvae provide a food source. I don’t have a fountain, because I haven’t wanted to deal with the hassle of electricity. In the future, maybe solar fountain technology will improve, but for now, it is a still water pond. Fall is here, and the weather is too cold for the water hyacinth and I have moved the papyrus in for the winter.